The Dukan Diet plan is very effective because you can eat as much as you want and still lose weight. 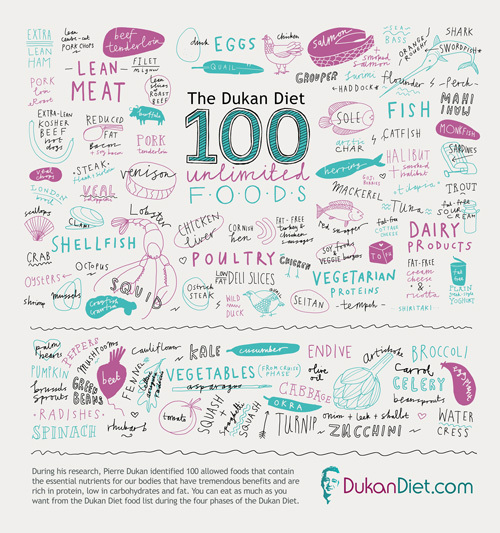 Below is the updated list of the 100 allowed foods for the Dukan Diet: 68 Pure Proteins and 32 Vegetables. To join coaching, first calculate your True Weight. During his research, Pierre Dukan identified 100 allowed foods that contain the essential nutrients for our bodies that have tremendous benefits and are rich in protein, low in carbohydrates and fat. You can eat as much as you want from the Dukan Diet food list during the four phases of the Dukan Diet. GOJI BERRIES : starting from the Attack phase. Limited quantity: Pure Protein days: 1 Tbsp , Proteins and Vegetables days: 2 Tbsps. Please note tablespoon should not be heaping. The 100 allowed foods: all their properties, nutritional qualities and associated Dukan recipes. Information on tolerated foods and foods that keep you feeling full.